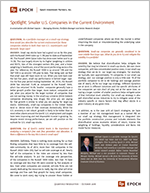 Spotlight on Smaller U.S. Companies in the Current Environment - Epoch Investment Partners, Inc. QUESTION. As a portfolio manager on small and SMID cap strategies, how would you describe the environment for these companies relative to their large cap counterparts leading up to the U.S. election? ANSWER. Small and mid cap stocks had a good run leading up to the election. The Russell 2000 Index, which represents small cap stocks was up 6.5% for the year as of November 8, the day before the election. The Russell 2000 Value Index did even better and was up 12.2%. This was largely driven by its higher weighting in utilities and REITS, two of the strongest sectors this year, and a lower weighting in healthcare, one of the worst-performing sectors this year. The Russell 2500 Index, which includes mid caps had similar performance and was up 6.6% leading up to the election (11.1% for the Russell 2500 Value Index). For reference, the Russell 1000 was up around 6.5% in the same time period and the Russell 1000 Value was up 9.1%. At that point, some commentators wondered whether the small cap play was over. We, on the other hand felt that small caps still had room to run. QUESTION. What has happened in the small mid cap spaces since the election? ANSWER. Since Donald Trump became President-elect, small and mid cap stocks have seen a considerable upswing. The Russell 2000 and 2500 were up 13.9% and 10.4% respectively from November 9 to December 31 compared to 5.2% for the Russell 1000. The general picture was the same on the value side with the Russell 2000 Value and 2500 Value returning 17.4% and 12.7% respectively versus 7.6% for the Russell 1000 Value. The positive reaction in stock prices was driven by the sentiment that a Trump administration would generally be positive for U.S. businesses through a combination of lower corporate taxes, less regulation and the potential for stronger GDP growth. QUESTION. What do you think will be the short and long-term impact of the new administration on small and mid cap stocks? ANSWER. Over the next several years, if the new administration is successful in lowering corporate taxes and helping to boost the growth rate of the U.S. economy, we believe that most stocks should benefit, but small and mid cap stocks even more so. First, revenue growth should be amplified in smaller cap stocks vs large caps from an uptick in GDP. Secondly smaller cap companies generally pay taxes at a higher rate than large cap companies because their revenues come primarily from the U.S. which has a higher corporate tax rate than almost every other market in the world. Large cap, multi-national companies typically have blended tax rates well below U.S.-focused small cap companies, due to the lower rates they are paying on the revenues that come from international markets. Lower corporate taxes should therefore result in a greater bump in earnings and free cash flow to smaller cap companies. Lastly, a stronger U.S. dollar has a less negative impact on small cap companies as they have less foreign revenue to translate back in to U.S. dollars. From an industry standpoint, less onerous regulations could benefit financial stocks, particularly banks, whose earnings would also grow more rapidly in a rising interest rate environment versus the very low rates we have seen since 2008. Certain sectors of health care, such as pharmacueticals, are also likely to benefit from less government intervention in product pricing. Companies with exposure to infrastructure spending should also be well positioned over the next several years. A stronger economy also implies stronger consumer spending since consumer spending makes up nearly 70% of U.S. GDP. That should bode well for consumer discretionary stocks that have the right products and services that consumers want. QUESTION. Against that backdrop, do you think that small and mid cap stocks still have room to run? ANSWER. When you look back over the last five years ending December 31, small-cap performance actually lagged larger caps. For that period, the Russell 2000 returned 14.4% while the Russell 2500 returned 14.5% and the Russell 1000 returned 14.6%. Smaller companies generally have a better growth profile than larger, more mature, companies and yet, when you adjust for the larger number of companies that are not earning money in the small-cap universe (think biotech companies developing new drugs), the price you are paying for that growth is similar to what you are paying for large-cap stocks. Additionally, small-cap companies in the United States tend to derive more of their revenues domestically. While the U.S. economy is not robust, growth is likely to be better than in most other places around the world. U.S. employment and wages have been improving and real disposable income is growing. So, despite recent strong performance, we are still positive on the outlook for U.S. small-cap stocks. QUESTION. One of Epoch’s central tenets is the importance of analyzing a company’s free cash flow generation and allocation. Is there a difference in the way this is done in small caps? ANSWER. Epoch’s investment philosophy centers around free cash flow — its generation and its allocation. We analyze free cash flow generation for small-cap companies in the same way we do for large-cap companies. Where we see a difference between large cap and small-cap companies is in the way they typically use that free cash flow. Larger companies are more mature, so they often have fewer growth opportunities relative to small-cap companies. Large cap companies will, therefore, typically give back more of their free cash flow to shareholders through dividends and share buybacks. Small companies, on the other hand, often have more opportunities to reinvest in the growth of their business. Thus, with small cap companies the focus is often on the success of their reinvestment. Epoch believes that companies should only reinvest, either in internal projects or acquisitions, if they can earn a return on invested capital on the project that is greater than their cost of capital. If they cannot, then we look for management teams to return that free cash to shareholders even in small-cap companies. QUESTION. Would you agree that the small cap space remains inefficient? ANSWER. Definitely. There is nothing more exciting for us than finding companies that have little to no coverage from the sellside community. As of 2014, more than 100 companies in the Russell 2000 Index (5%) had no sell-side coverage at all. Nearly half of the companies in the Index are covered by less than five sell-side analysts. To put the coverage into perspective, of the companies in the Russell 1000 Index, less than 1% have no coverage and less than 8% were covered by five analysts or less. Even when companies are covered, sell-side firms are not usually dedicating the resources to really dig into what will drive earnings and free cash flow growth for many small companies. We come to work every day trying to uncover those hidden or underfollowed companies where we think the market is either mispricing the stock or misunderstanding the underlying value in the company. QUESTION. Small-cap companies are generally considered to be more volatile than large caps. What do you do to try and mitigate this volatility in a portfolio? ANSWER. We believe that diversification helps mitigate the volatility that may be inherent in small-cap stocks. We own more companies, with less concentrated position sizes, in our small-cap strategy than we do in our larger-cap strategies. For example, we typically own approximately 75 companies in our small cap strategy, and our average position is only a little over 1% of the portfolio compared to 40 to 60 holdings and average position size of nearly 2% for our large cap strategy. Different dynamics are at work in different industries and the specific attributes of the companies we own don’t all play out at the same time, so having a larger number of smaller positions helps mitigate some of that individual stock volatility. Our small-cap strategy is also well diversified across industries to try to mitigate some of the industry specific or macro factors that may affect stocks in a given industry at any given time. In addition to diversification, Epoch’s investment philosophy focuses on companies that generate strong free cash flow and also the ability to grow that free cash flow and allocate capital in the best interst of shareholders. This methodology inherently results in a portfolio that has slightly less volatility than the overall small cap indices. As is the case with all Epoch strategies, we also have a member of our risk management team as a named PM on our small cap strategy. Risk management is integrated into the portfolio construction process and includes elements like diversification across economic drivers of return, inverse risk weighting of holdings, liquidity considerations and Barra risk model factor measures.